B&W image of the HP 150 personal computer . A woman is sitting at a desk with the HP 150, she is entering data to the keyb0oard from a sheet of paper. The display screen has a form displayed. In the background are windows looking out on to trees. There is a chair and filing cabinets in the background. 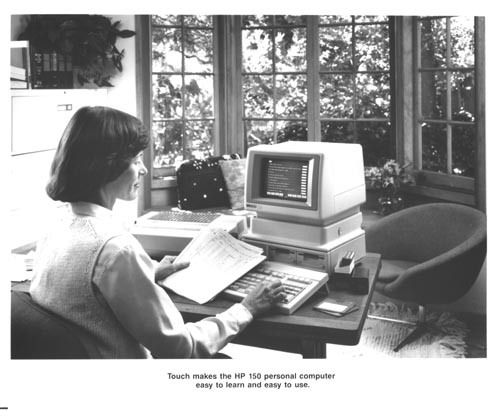 Label at bottom of image " Touch makes the HP 150 personal computer easy to learn and use.."